This is a large guest book for the rebranding of the Ullna golf club in Sweden; a course redesigned by Jack Nicklaus. 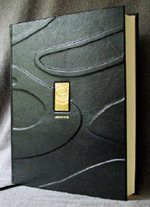 This large book is intended to be a place where guests can write about their experiences on the course. My customer had a very precise idea about how he wanted the book cover to look. I was able to get very close to his original rendering. 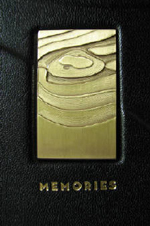 My customer supplied me with an etched brass plaque that is inset into the front cover (the plaque features the new logo of the golf course which was enlarged for the raised topographic design of the book cover). My customer also had a specific font and font size he wanted used for the gold cover lettering. To match his design, I had custom metal dies made for the cover stamping so that the lettering could look exactly the way he wanted (I did not have moveable metal type in my customer's preferred font). 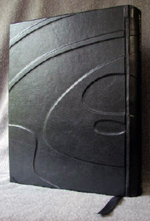 The black goatskin leather used for the cover gives the book an understated and elegant feel, while the large size of the pages make it substantial and rather monumental. 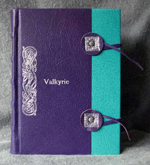 This journal was created for a customer who likes bright colors. 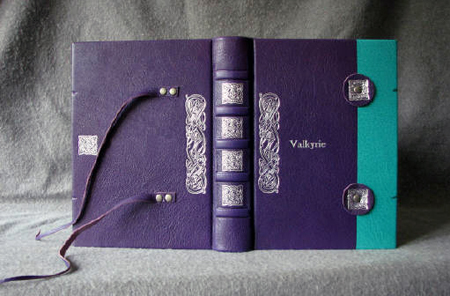 I can custom-order more vibrant colors in book leather though they are less common and can be more expensive (less-expensive book leathers are not available in these colors). 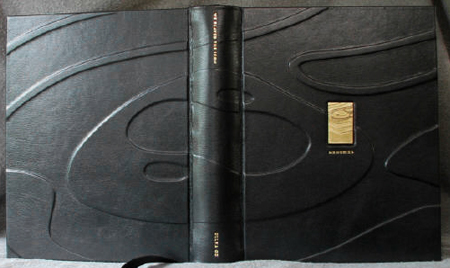 This book has two long strips of leather that fit into the grooves you can see at the edges of the front and back covers before wrapping securely around the leather discs on the front cover. The disc are riveted through the cover and decorated with celtic knots to tie it all together. A very touching project for a family's beloved dog who passed away. 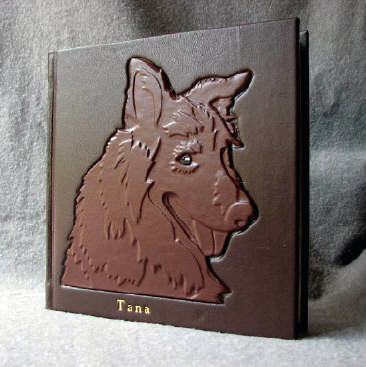 My customer wanted an album with her dog's portrait, done in leather, on the front cover. She wanted a place to keep photos and mementos of her late friend. 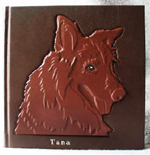 Working from a photo she sent, I created the raised design of her dog which was individually-covered with medium-brown leather before being attached to the cover in a slightly recessed area. 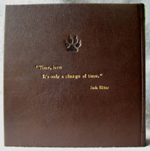 A custom metal die was made to add the blind-stamped paw print on the back cover with a quote below it. 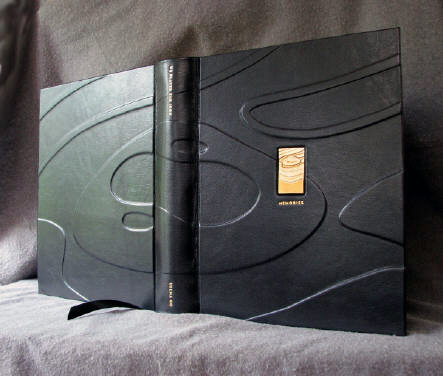 This book was created for a customer who started hand-crafting kilts and he wanted to have a book where he could record designs, patterns, etc. Originally, the inset on the cover was going to be a separate piece of board covered with a tartan-patterned cloth, but I somehow convinced my customer (who likes my metalwork) to let me try to do the tartan pattern in fold-formed copper. He sent me an example of what he wanted and I created it in a rather rustic version using fold-forming. The varigated patina on the copper piece is a result of the oxidation that builds up over multiple heatings and selective cleaning of certain areas. Made for an incredible jewelry artist whose work I admire, the raised cover of this book mimics the design of a bracelet piece I commissioned from him. 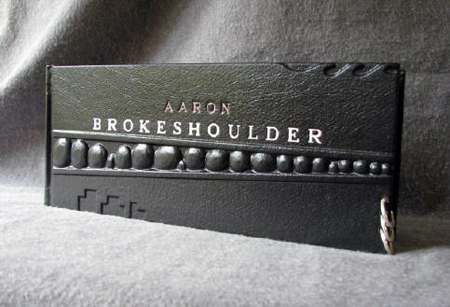 Each "stone" is carved indivdually from binder's board and attached to the cover before the leather is added. One feature of Aaron's jewelry that I particularly liked at the time was the addition of free-swinging silver rings through his bracelets that added a great sense of movement to the piece. 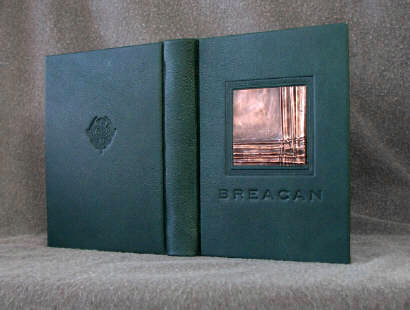 My customer contacted me well ahead of the due date for this book which was good because creating the very small carved/raised line of pewter "dishes" on a shelf took awhile. Intricate work like this always takes more time. 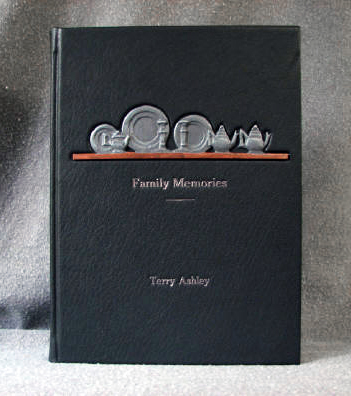 This book is a place to record family stories, written by an individual who is passionate about collecting antique pewter. The "shelf" is leather that I marbled using ink and Suminigashi marbling technique, then it was waxed to deepen the color and contrast. The pewter "dishes" are accented with a suble silver metallic pigment to give them a slightly metallic sheen. 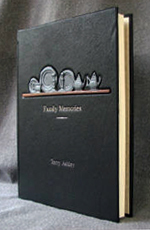 This book was created to be an autobiographical journal for my customer where she planned to record the story of her life. She wanted to incorporate many symbols that were meaningful to her. 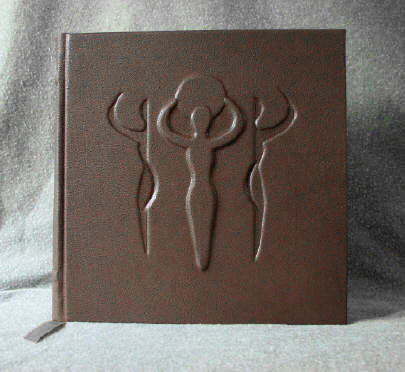 The cover features a "maid, mother, crone" design that is both raised above the surface of the cover and carved below the surface (see if you can spot the moon phases). 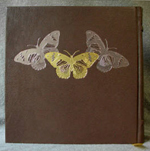 The back cover features three stamped butterflies in foil. Gold Celtic knots accent the top and bottom of the spine above and below the raised cords. 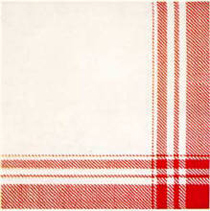 Goatskin often gives you a softer look with raised designs than pigskin does, but has the lovely soft, "open" finish that my customer wanted. This is not a blank book. This one has printed pages sent to me by my customer. This book contains letters from family members for a nephew's birthday. The nephew's initials "CW" appear, raised, at the center of the intricate compass on the front. My customer wanted to have a book that reflected her nephew's journey through life and sense of adventure, so the endpapers for this volume are colorfully-printed world maps (one for North America at the front of the book and one for Europe at the back). 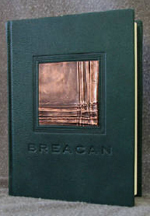 The boot prints on the back cover, stamped in pewter foil, reinforce the idea of life as a journey. 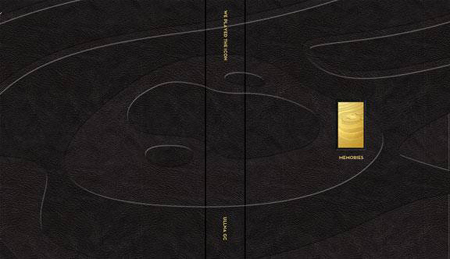 This is a good example of how a logo can be turned into a raised cover design. 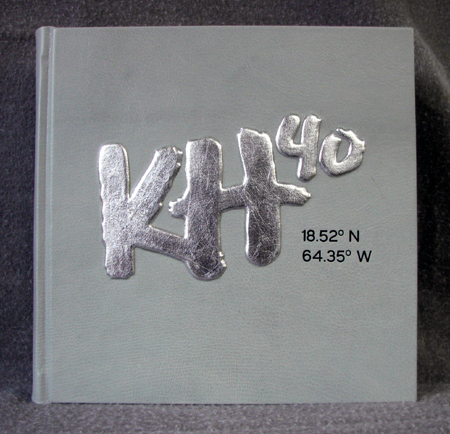 This allows the cover image to be much larger (covering most of the cover) than it would be if the logo were made into a metal die and stamped onto the cover (a metal die has a maximum size of 5" square). The logo here was created from several layers of hand-cut tag board, layered to form the raised design. 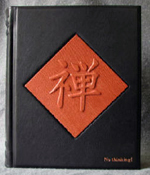 Pigksin leather works exceptionally well for raised designs like this; giving a very crisp result. Another good example of a large raised design on a book cover. Here, the design covers the front and back cover and every element is raised (including the intricate tattoo-style script lettering). The design was based on a sketch my customer sent me. It reads, on the front, "Be the one to guide me", and, on the back, "but never hold me down". I like the way the raised design takes center stage here. No foil lettering or light/bright foil colors distract from the intricate nature of the raised designs. Burgundy endpapers and a burgundy ribbon provide a touch of color. 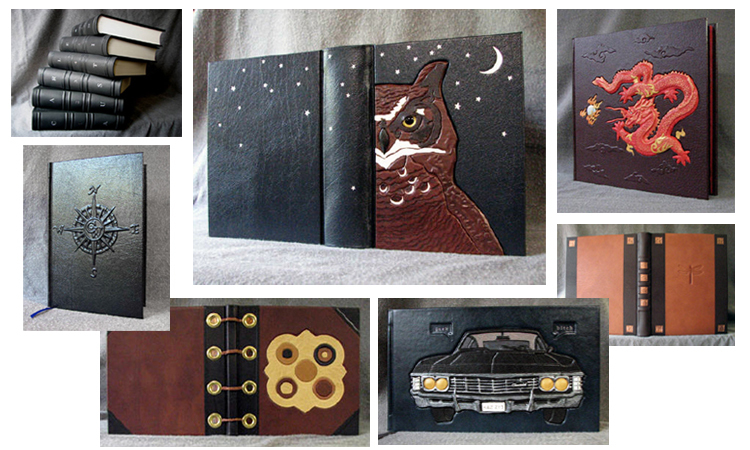 I really enjoy collaborating with my customers and this book is a good example of that collaboration. 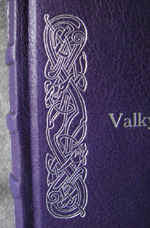 This customer of mine does leather carving and he created this beautiful, intricate, Celtic knot carving which he watned to incorporate into a book cover. This book was created as a meditation journal and my customer wanted a book with two front covers that you could flip over and read from the opposite cover to the center of the book. 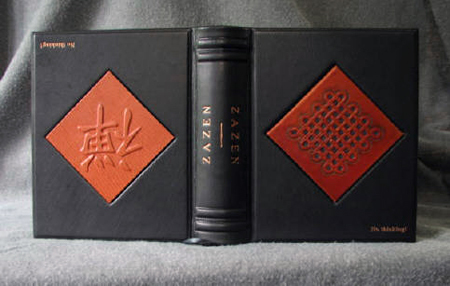 To compliment the lovely carving created by my customer (which I mounted on board before insetting it into the cover), I created a similarly-shaped panel with a raised zen symbol design covered with hand-pared goatskin leather in a color that complimented my customer's carving. Copper foil lettering also went well with the inset designs. This scrapbook was created to hold photos from a 40th birthday party. The logo on the front was created for the party. I turned that logo into a raised design on the front cover, accented with attention-getting silver foil leaf. The coordinates for the location of the party were stamped in black pigment. I was surprised at my customer's color choices here, but I can't deny that the result is striking. This book was created to record the memoirs of someone who had a particular love for a very specific type of South African steam locomotive. My customer provided me with the name and model of the train and I found a variety of photos online which I used as a starting point for creating the raised locomotive design of that exact train on the front cover. More intricate designs like this are time-consuming and definitely add to the cost of the project. The steam engine is accented with pewter foil rivets, added one at a time with hot foil stamping. 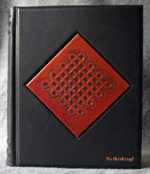 This unique book was created for a poet whose logo was this gas mask with a stylized monogram in the lower part of the mask. I always enjoy creating cover designs that are extremely personal to my customers and this one definitely fits that description. The single large buckle closure on a dark brown leather strap that is securely riveted through the cover board completes the design. 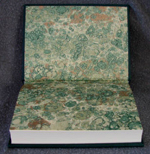 Rust-colored batik pattern endpapers compliment the cover leather. This guest book was created for a home in Mexico. 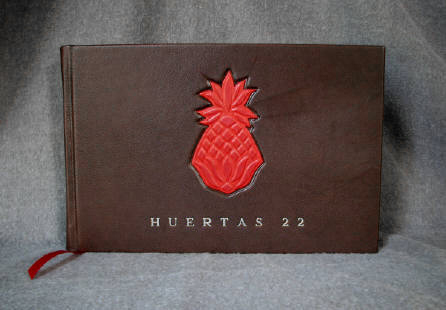 My customer chose the dark brown and red color scheme and wanted to incorporate a "Mexican colonial pineapple". 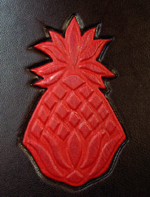 The pineapple was built with several layers of thin board covered with hand pared red British book calf. That piece was then attached to the cover in a slightly recessed area. Gold lettering added the final touch. 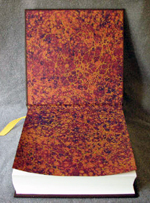 I created this journal for my Canadian friend and fiber artist Carol Iwassa. You can view some of her amazing work on Facebook by typing in "KooWool" into the Facebook search box. She has made felted hats with eyeballs on them, so I wanted to make her a book with an eyeball. To suggest something about Canada on the cover, the raised area around the resin taxidermy dragon eye morphs into a variety of fall-colored maple leaves that "blow" across the front cover and spine and onto the back cover.